Sam Vokes is aware of the stigma surrounding Burnley’s away form in the Premier League but the striker is focussing on the bigger picture. The Clarets are one of only two teams in the top four tiers who have yet to register a win on their travels - the other being Rotherham United in the Championship - and the Welshman wants to get that chalked off before the season is out. 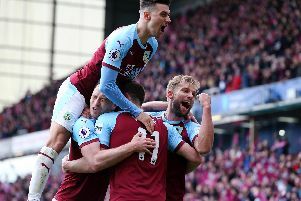 However, with a handful of games remaining and eight points cushioning the gap between themselves and the relegation zone, Vokes is more concerned with securing the club’s future in the top flight. Following the 3-1 defeat against Everton at Goodison Park, which was Burnley’s 13th loss of the term away from Turf Moor, he said: “It’s a big stigma of ours this year and people mention it all the time but for us, with performances like today, it’s hard to see how we haven’t got that result away from home. He added: “The bigger picture is massive for us. Survival is the key thing. To get there we’re going to need some more points away from home. The silver lining for Vokes in the defeat in Merseyside was an eighth goal of the campaign. The forward’s first goal in 11 games came from the spot in the 52nd minute after he was brought down by Toffees goalkeeper Joel. “Personally it’s nice to get that goal, but I’m gutted we couldn’t see the job out because we put on a great performance and a good shift,” he said.